[Blackcorvo] wrote in to tell us how he took a cheap “retro” guitar amplifier and rebuilt it with sub-miniature vacuum tubes. The end result is a tiny portable amplifier that not only looks the part, but sounds it to. He’s helpfully provided wiring schematics, build images, and even a video of the amplifier doing it’s thing. The original Honeytone amplifier goes for about $26, and while it certainly looks old-school, the internals are anything but. [Blackcorvo] is too much of a gentleman to provide “before” pictures of the internals, but we looked it up and let’s just say it doesn’t exactly scream high quality audio. Reviews online seem to indicate it works about as well as could be expected for an amplifier that costs less than $30, but this is definitely no audiophile gear. Powering up the miniature vacuum tubes takes a bit of modern support electronics, including a buck converter to provide the high voltage for the tubes as well as a 6V regulator. The plus side is that the new circuit can power the tubes from an input voltage between 12 and 30 volts, meaning the amplifier can still be powered by batteries if you want to take it on the go. We’ve seen some fantastic tube amplifier builds over the years, proving that some things never go out of style. If you’d like to learn more about the magic that lets these little tubes of hot pixies make beautiful music, the US Army has you covered. [curcuz]’s BoomBeastic mini is a Raspberry Pi based smart connected speaker. But don’t dis it as just another media center kind of project. His blog post is more of a How-To guide on setting up container software, enabling OTA updates and such, and can be a good learning project for some. Besides, the design is quite elegant and nice. The hardware is simple. There’s the Raspberry-Pi — he’s got instructions on making it work with the Pi2, Pi2+, Pi3 or the Pi0. Since the Pi’s have limited audio capabilities, he’s using a DAC, the Adafruit I2S 3W Class D Amplifier Breakout for the MAX98357A, to drive the Speaker. The I2S used by that part is Inter-IC Sound — a 3 wire peer to peer audio bus — and not to be confused with I2C. For some basic visual feedback, he’s added an 8×8 LED matrix with I2C interface. A Speaker rounds out the BoM. The enclosure is inspired by the Pimoroni PiBow which is a stack of laser cut MDF sheets. The case design went through four iterations, but the final result looks very polished. On the software side, the project uses Mopidy — a Python application that runs in a terminal or in the background on devices that have network connectivity and audio output. Out of the box, it is an MPD and HTTP server. Additional front-ends for controlling Mopidy can be installed from extensions, enabling Spotify, Soundcloud and Google Music support, for example. To allow over-the-air programming, [curcuz] is using resin.io which helps streamline management of devices that are hard to reach physically. The whole thing is containerized using Docker. Additional instructions on setting up all of the software and libraries are posted on his blog post, and the code is hosted on GitHub. There’s a couple of “To-Do’s” on his list which would make this even more interesting. Synced audio being one: in a multi-device environment, have the possibility to sync them and reproduce the same audio. The other would be to add an Emoji and Equalizer display mode for the LED matrix. Let [curcuz] know if you have any suggestions. Have you ever wanted to build a high quality audio crossover and amplifier? [Rouslan] has put a lot of thought into making his dual amplifier studio monitor both high quality and simple to build. 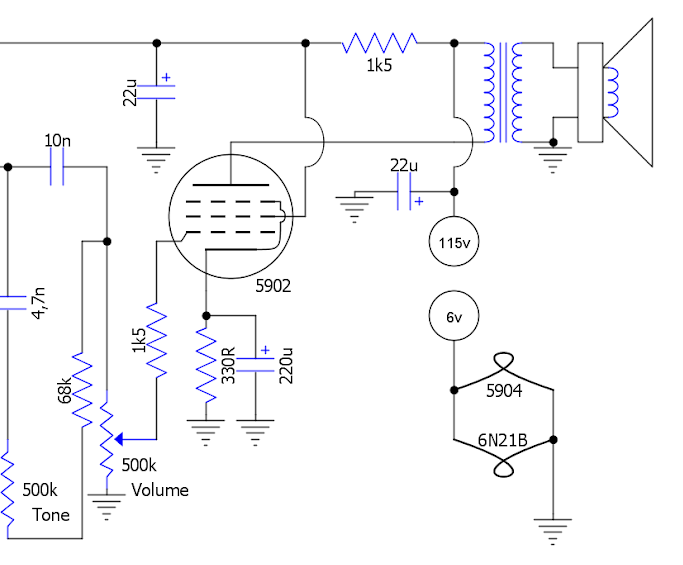 With a concise schematic, a meaningful block diagram, and simulation results to boot, his well-written post has everything you need to build self-powered bi-amped speakers based on the LM4766 from Texas Instruments. It is great to see simulations which verify the functionality of the circuit, this can go a long way when working with complicated analog filters and audio circuitry. For those of you who do not have access to PSPICE (an expensive professional simulation tool), [Rouslan] uses LTspice from Linear Technology. TINA-TI from Texas Instruments is another great free alternative. Additionally, [Rouslan] goes over the typical issues one has with a bi-amplifier studio monitor, such as phase misalignment and turn-on pop, and then provides a solution. Note that his project is powered by 20VAC, which requires an external transformer to convert the 120VAC in the wall to 20VAC. Be careful with high voltages! In the future, adding a high quality voltage regulator will most likely increase the performance. His post finishes up with a very clean circuit board, which he ordered from OSH Park. With such a complete design, there is nothing keeping you from building your own. Go out and put that old speaker sitting in your basement to good use! If you don’t have an old speaker sitting around, check out these very cool DIY speakers. For young children, music is a wonderful and exciting thing — but do you really want them playing with your phone, or worse yet, an iPod? [Arons] decided to make the MBox, an Arduino powered MP3 player. He was inspired by hörbert, a very similar wooden MP3 player for children. Apparently it’s a great product, but it also costs 239€. We don’t blame him for wanting to make his own. The MBox follows the same exterior design as hörbert — though we must admit, he could have spiced it up a bit! It uses an Arduino Uno at its core with a Freaduino MP3 music shield, capable of playing all the typical formats like MP3, MIDI, WAV, and even Ogg Vorbis. To amplify the sound he’s using a Mono Audio Amp Breakout board from SparkFun which drives an 8Ω loudspeaker. A mini USB power brick provides the juice, and a 12-digit keypad provides the ability to select music — each number plays from a different directory on the SD card. [Arons’] daughter loves it, and he probably only spent a fifth of what the real hörbert costs! [Ynze] has built an audio amplifier that looks and sounds great. His amplifier uses a National Instruments (now TI) LM3886 Overture series 68 Watt power amp. The LM3886 places [Ynze’s] amp squarely in the “Gainclone” catagory. Gainclone or Chipamp are terms long used by the DIY community to describe audio amps based upon highly integrated semiconductor amplifiers. The Gainclone name stems from the original Gaincard audio amplifier sold by 47 labs. The Gaincard used less than $100 USD of parts when it was introduced in 1999. It sounded good enough to command a $3300 USD price tag on the audiophile market. The low parts count and simple construction spawned the audio DIY community to build their own versions of the Gaincard. Hundreds of variants exist now, and wading through the different versions can be a bit of a daunting task. [Ynze] found a basic design that works, and built from there. One of the interesting things about [Ynze’s] amp, as well as many of the Gainclones, is the fact that they use no circuit board. All wiring is done point to point. resistors are soldered directly to the pins of the amplifier chip. This can be some tricky soldering for beginners, but several PCB kits are available. [Ynze] built his amp in two cases. One case holds the power supply, and the other contains the amplifier itself. [Ynze] is using a large toroid transformer to drop his local 230V mains down to +25V and -25V. The amplifier circuit itself is simple – a few discrete components surround the LM3886 and it’s heat sink. [Ynze] also did some very nice carpentry work on his wood chassis. The resulting amp looks like it’s right out of the 1960’s – but hides 1990’s electronics inside.